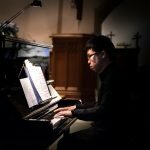 Christopher holds a Bachelor of Music in Piano Performance from the University of Toronto, studying under Dr. James Parker and the great pianist Dr. Boris Lysenko. He has also taken lessons with world-renowned piano masters including Drs. John O’Conor, Jerome Lowenthal, Peter Bithell, John Perry, Robert Silverman and Edward Auer. Christopher’s love for music has resulted in numerous awards and scholarships, including grand prizes at music festivals both at home and in America. Under the tutelage of renowned pedagogue Marina Geringas, Christopher took his RCM Grade 10 piano exam at the age of 11, achieving First Class Honours with Distinction, with a mark of 95. Christopher completed his Royal Conservatory of Music ARCT Diploma in Piano Performance at the young age of 14, again with Distinction. Christopher believes that each student is unique, with different strengths, interests and goals. He tailors his lessons to each student’s learning style and needs. Christopher not only equips his students with the fundamentals of music (musical literacy, rhythm and ear training), but works with them to make beautiful music through his emphasis on tone production and musical phrasing. His goal is to help each student reach their full musical potential, and to instill a love of music which they can carry with them for a lifetime. In addition to teaching, Christopher accompanies soloists for music examinations, music festivals, auditions, recitals and master classes. Christopher is the official accompanist for various vocal and instrumental teachers and Musical Theatre Camps. Christopher also enjoys playing the piano for various events, either as a background musician or as an accompanist. He has experience playing in numerous weddings, Confirmations, birthday parties, wine & cheese events, and more. Christopher enjoys playing in various styles, including classical, easy listening, pop, and musical theatre. Christopher enjoys singing both choral and popular music, and has been an integral member of many choirs, most recently performing in “Paul Bunyan”, an operetta by Benjamin Britten. Christopher is also a singer/songwriter, orchestral composer, arranger, and music producer, and has written various pieces of music in his original style. He is also the official arranger/orchestrator for various choral groups. Christopher has performed at the Four Seasons Centre for the Performing Arts and at the CBC’s Glenn Gould Studio, in addition to performing at the Niagara International Chamber Music Festival for many years. Christopher was invited to perform with the NYCO Symphony Orchestra at their Season Finale Concert as a result of winning the NYCO Concerto Competition. Christopher was also privileged to perform on Glenn Gould’s piano at the Roy Thomson Hall. Other performances include invitations to perform at the 2007 CFMTA-MTNA-RCM World Pedagogy Conference in Toronto and at salon concerts featuring Yefim Bronfman & Jacques Israelievitch.